If you’re interested in the armies that fought at Gettysburg, we invite you to come by and see our Graphical Order of Battle. An “Order of Battle” shows the organization and hierarchy of the army but you’ve never seen one like this before! It is a big graphic chart — sort of like a big family tree — and it is a great way to learn about the participants in the battle. But it is so much more than a typical Order of Battle! 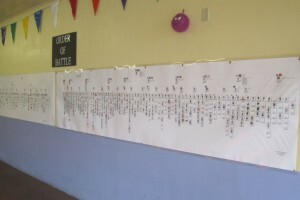 The Graphical Order of Battle includes the commander of each army and that of each corps, division, brigade, and regiment, along with his rank and (when available) his photograph, headquarters staff, troop strength/losses, and artillery complement. Corps insignia and notable unit nicknames are also included. The names of participants are color-coded to distinguish those officers who were killed or mortally wounded (red), wounded (pink), and missing/captured (blue border) — and, in those cases, the chart shows the succession of command over the course of the 3-day battle. Finally, a citation is provided to the report of each commander/unit in the Official Records (ORs). This distant snapshot shows about half of the chart for the Army of the Potomac. The corps and division levels reflect the battle flags that these units used to distinguish themselves on the battlefield. 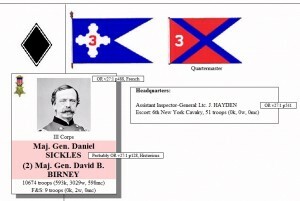 Major General Dan Sickles was the commander of III Corps, the insignia and battle flags for which are shown. Sickles was awarded the Medal of Honor. When he was wounded in battle (pink), command fell to Major General David Birney who was also wounded. Click on any image to zoom. 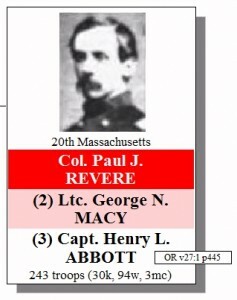 The 20th Massachusetts was commanded by Colonel Paul J. Revere (grandson of the Revolutionary War midnight rider). When Col. Revere was mortally wounded, command of the 20th Mass fell to Lt. Col. Macy. When he too was wounded, Captain Henry Abbott took command of the regiment. As shown, Captain Abbott subsequently filed the ‘Official Report’ for the regiment (Series 1, Volume 27, page 445). 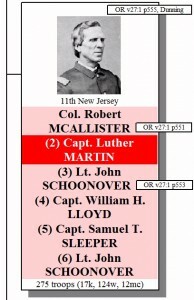 The 11th New Jersey had six commanders over the course of the 3-day battle. One of them was killed and ALL of the others were wounded. Two of the commanders (McAllister and Schoonover) filed Official Reports about the campaign, as did Captain William A. Dunning. The citations for all three of those reports are shown. As also shown, the regiment started the battle with 275 men and, of those, 17 were killed or mortally wounded, 124 were wounded, and 12 were missing or captured. The Graphical Order of Battle for the Army of the Potomac (Union) is 18 feet wide (!) and is finished. The chart for the Army of Northern Virginia (Confederate) is 15 feet wide and is also on display at our location but we haven’t yet added all of the photos that we have for Confederate officers. Per your Facebook message, I’ve fixed Col. Cross (who was never promoted to Brigadier General), thanks.